Erik Kjelland is a man with a plan. Actually, the Madison-based musician always seems to be in the middle of creating a new plan, while taking another to completion. Lucky for us, Erik’s plans typically revolve around music for the greater good. Currently, he shares his own terrific talent in so many ways; as a soulful singer-songwriter, dynamic leader of the award-winning band, The Mascot Theory; and as one-part of the beautiful duo, Kerosene Kites. Also in recent years, Erik has been the frontman in forming some strong collaborations leading to music as a vehicle for raising funds and awareness. He’s done it for the Keep Wisconsin Warm/Cool Fund with the wildly successful Flannel Fest, and next he’ll do it for the Wisconsin Vinyl Collective, a brand new project aimed at highlighting the many great musicians based in, or originally from, the Badgers State. One of the people Erik approached? Butch Vig of Smart Studios and Garbage fame. The Wisconsin native quickly said, “yes” to his request, and Erik just returned from a few days in L.A. where he met up with Butch, and they plotted the next steps to solidify the future of the Wisconsin Vinyl Collective. Before this first of its kind event, I asked Erik about the partnership with Butch, the goals of the project, and why it already means so much to him. Maximum Ink: Where did you get the idea for a Wisconsin Vinyl Collective project? Erik Kjelland: Inside my brain is a mixed cluster of ideas and projects that skirt the line between creative and ridiculous. Wisconsin Vinyl Collective (WVC) is really a collection of a bunch of those nuggets. I was kicking around the idea of a local music compilation album released by my record label, Stone After Stone Records, and as a means to put on a fun charity event in Madison, like a spring edition of Flannel Fest, the annual fall Americana music showcase Beth Kille and I created to raise funds and awareness for Keep Wisconsin Warm/Cool Fund. MI: What is the importance behind a project like this? EK: The “Wisconsin Vinyl Collective” name tells the story. It’s a group effort. Through this project, we’ve been able to draw attention to numerous people and organizations; specifically, the nationally-known musicians who have shaped and inspired our Wisconsin music scene like the BoDeans and Butch Vig, along with the up and coming artists like Gabe Burdulis (Future Stuff), Trapper Schoepp, and Seasaw. We’re also getting support from the inspirational independent record stores around our state, as well as many other stores throughout the country who have agreed to carry this release. MI: You must be proud of how this came together? EK: The musician side of me is extremely excited to release a brand new song from my band The Mascot Theory on such an iconic medium like vinyl for the first time. The graphic designer- side of me is blushing that I finally get to create artwork for the 12”x12” format, which really showcases the gallery-worthy Wisconsin landscape photography by Loren Zemlicka. On a 10,000 feet above-it-all viewpoint, I’m just honored I can bring together so many great people to create something cool and hopefully inspirational with music as the backbone. MI: Who picked or decided on which bands should be included? It could not be easy to narrow it down for Volume One? 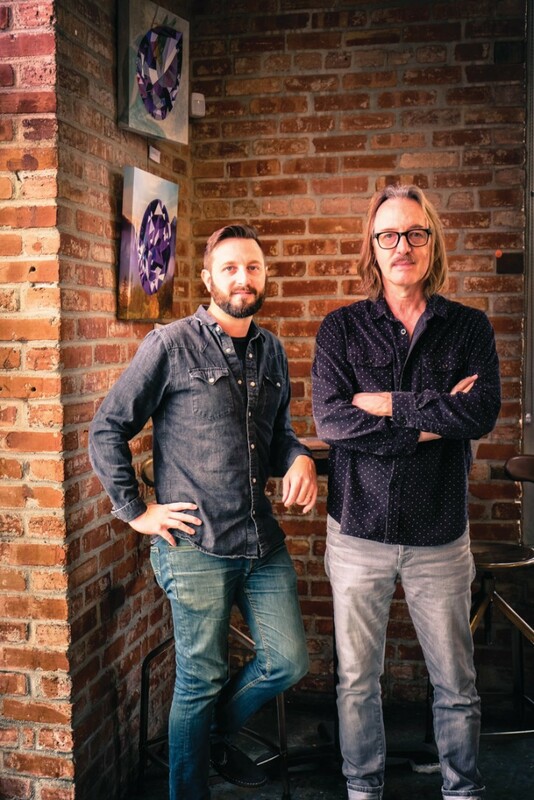 EK: I reached out to Butch Vig with this WVC idea, and he said he would be honored to be a mentor for the project, and he offered a previously unreleased song from his Emperors of Wyoming band to be included on the album. His involvement opened some doors and widened the scope of WVC as we soon had commitments from other nationally known artists with Wisconsin ties, like the BoDeans and Cory Chisel. It became a mission of mine to make certain we not only had WVC representation from the Madison musician talent pool, but also included songs from other areas of the state. MI: The first National Music Festival and Conference is happening in Madison in June, and it feels like the scene is growing in a cohesive, supportive way. Why is this important now, and for the long run? EK: I greatly believe that in order for Madison to continue to grow as a strong music scene, we need to learn from, inspire, and embrace the other scenes developing and thriving in Wisconsin. For example, Appleton’s Mile of Music Festival is a true one-of-a-kind festival that is gaining national attention, and I am extremely excited that we have partnered with the festival’s organizers to expand the reach of the WVC project into the Fox River Valley area of the state. WVC is not just a Madison project, it is meant to bring recognition to quality music throughout our entire state. MI: The strength of the WVC project is also built, in part, on vinyl. Honestly, a project like this could get some great attention due to the caliber of music on it, and the specialness of it being released only on vinyl. EK: I think for some people vinyl is a tangible throwback to fond memories from their youth, like when I used to spread out my dad’s record collection over the living room floor like a tapestry of awesomeness. When you can touch something, it becomes more real, more inclusive, more of an event. The same goes for music. The vinyl format allows us to tap into this physical format; so very different than the virtual (yet arguably more convenient) streaming, and digital music delivery methods available today. But, we aren’t totally dissing or shunning digital as every WVC vinyl album comes with a free digital download of the album. We also consciously decided to skip the CD format so we could be a part of the official April 22 Record Store Day event, the nationally celebrated independent music store holiday. WVC Volume One is a limited run, only 1000 copies have been pressed. We are fortunate to have national distribution through our tie to Record Store Day which will allow us to spread the WVC project to the rest of the country. MI: What’s next for WVC? And my personal goal is to discover a few up and coming artists throughout the state who deserve a little national recognition.